After Five Years of War in Syria, UN Passes Resolution on Talks: Can Russia Shape Those Talks on the Ground? Russian Federation President Vladimir Putin remains confident about Russia’s intervention in Syria. He has outlined Russia’s objectives there and is providing the Russian Federation Armed Forces what they need to achieve them. UN Security Council Resolution on Syria 2254 calls for talks, but leaves the matter of Syrian President Bashar al-Assad’s presidency open and allows for continued action against ISIS and other Islamic militants. That leaves Putin able to use the forces of Russia and its allies in Syria to help Assad remain in power. UN Security Council Resolution on Syria 2254 essentially calls for the following: a ceasefire must be established and formal talks on a political transition must start in early January 2016; groups seen as “terrorists,” including the Islamic State of Iraq and Greater Syria (ISIS) and the Jabhat al-Nusra, are excluded; “offensive and defensive actions” against such groups, referring to US-led and Russia airstrikes, can continue; UN Secretary-General Ban Ki-moon should report by January 18, 2016 on how to monitor the ceasefire; “credible, inclusive, and non-sectarian governance “ should be established within 6 months; free and fair elections” under US supervision to be held within 18 months; and, the political transition should be Syrian led. As a Member of the Permanent Five Members of the UN Security Council, Russia’s role as a party to November 18th Syria meeting was essential, but hardly prosaic given its ties to Syria. As a matter of fact, Russia has a congenial relationship with the Assad regime unlike other Permanent Five Members. Russia has been working closely with Iran to provide the Syrian Government with military support. Indeed, Putin went into Syria both to “stabilize the legitimate authority” of Assad and to fight ISIS. While the administration of US President Barack Obama has been engaged in a desultory effort to remove Assad since 2012, Putin recognized the US would keep working against Assad regime until it fell or ISIS, too strong for the Syrian Opposition to contend with, took control in Syria. Putin has not forgotten the results of the Obama administration’s support of rebels in opposition to Libyan President Muammar el-Gaddafi, a friend of Moscow. Multinational forces under NATO command, mandated to impose a no-fly zone under UN Security Council Resolution 1973, exceeded their mission, destroying pro-Gaddafi forces as part of Operation Unified Protector. Gaddafi’s regime fell; he was killed. To Putin, it was a cunning deceit and dark tragedy. He does not want anything similar to occur in Syria. Long before factions of the Syrian Opposition might establish among themselves common facts, presuppositions, and policies for the UN Talks, and before the first vote is cast in UN monitored elections, Russia and its allies may take steps to lengthen Assad’s tenure as president. Russia, is a very capable military superpower. Indeed, Russia could shape the situation on the ground by supporting the Syrian Armed Forces along with forces Iran has brought to, or organized in, Syria. Deliberate progress is being made toward that goal. A large military offensive, purportedly being organized, may allow Syrian, Iranian, and Iranian-led forces to regain control of a large portion of Syrian territory. The Syrian Government might work to “ensure” the political perspectives of local political leaders, administrators, and the civilian population, in reclaimed territory were supportive of Assad. Diplomatic efforts at the UN Talks by Russia and Iran would be conducted in conjunction with the military activity. Perhaps UN Security Council vote, rather than create an agreement for Assad’s removal and transition to a government favorable to the US, EU and some Arab States, may have instead convinced Russia and Iran that shaping events on the ground militarily in Syria is the best way to secure their interests. Principiis obsta (et respice finem). Resist the beginnings (and consider the end). Putin’s decision to go into Syria was not made overnight. Since 2012, he has watched the international community fumble and Syria crumble. He has long considered Russia’s military capabilities and the possibility for their successful use in Syria. He knows what he wants to do and how to do it. He will not become subsumed by Syria. If Russia were to act with more force and increase the pace of its operations in Syria, the Russian Federation Armed Forces would become a decisive factor in Syria and, correlatively, in the UN Talks. Gaius Seutonius Tranquillus, a Roman historian who wrote during the early Imperial era of the Roman Empire, wrote in De Vita Caesarum that Rome’s first emperor, Imperator Caesar Divi Filius Augustus (Augustus Caesar) abhorred haste and rashness in a military commander. He preferred that actions be taken with an appropriate balance of urgency and diligence. Rushing through to execute tasks often led to mistakes and sustained results are not achieved. Accordingly, one of his favorite sayings was festina lente (hasten slowly). Many in the West complained from the start of operations by the Russian Federation Armed Forces in Syria that they were ill-fated, immediately bogged down, or inappropriately conducted. On September 30, 2015, US Secretary of Defense Ashton Carter stated about Moscow’s military involvement in Syria, “The Russian approach here is doomed to fail.” Obama stated on October 2, 2015: “An attempt by Russia and Iran to prop up Assad and try to pacify the population is just going to get them stuck in a quagmire and it won’t work.” At a December 18, 2015 news conference, Kerry stated in an effusion of sentiment that 80 percent of Russian airstrikes were hitting Syrian Opposition groups fighting Assad’s forces and not hitting ISIS forces. Putin’s decision to go into Syria was not made overnight. Since 2012, he has watched international community fumble and Syria crumble. He has long considered Russia’s military capabilities and possibilities for their successful use in Syria. He knows what he wants to do and how to do it. Putin in no way wants support Syrian Opposition forces in their effort against Assad so it would make sense for Putin to pace Russia’s actions against ISIS, to learn the landscape and ensure the Syrian Opposition gained no advantages. To that extent, it should have been expected that he would not hesitate to disrupt the Syrian Opposition’s activities where he could. Regarding costs for the Syria operation, so far, Putin has well-managed them. Vasily Kashin, an analyst at the Center for Analyses of Strategies and Technologies in Moscow, explained: “All available data show us that the current level of military effort is completely insignificant for the Russian economy and Russian budget.” Senior administration and intelligence officials in the US, in anonymity, agree with that assessment. Once in Syria, Russia began using many of its latest weapons systems. New systems used have included: the sea-based Kalibr 3M-14 cruise missile, launched from surface ships and submarines from as far as 900 miles away from their targets; the air launched KH-101 cruise missile; and, the Sukhoi Su-34 strike fighter. On December 19, 2015, Reuters quoted Putin as saying: “We see how efficiently our pilots and intelligence agents coordinate their efforts with various kinds of forces—the army, navy, and aviation; how they use the most modern weapons.” However, Putin continued, “I want to stress that these are by far not all of our capabilities,” adding, “We have more military means. And, we will use them—if need be.” Putin seemed to imply that Russia may ramp up the size and speed of its operations in Syria. By acting more robustly and increasing the tempo of its operations, the Russian Federation Armed Forces would certainly be the decisive factor on the ground in Syria and, correlatively, in the UN Talks. Both the ISIS and the Syrian Opposition would find it difficult to hold territory in the face of a superpower-sized onslaught organized by Russia and its allies. Seizing the maximum amount of land possible may very well enable the Syrian Government to influence the political landscape thus furthering Putin’s goal of keeping Assad in power. Heartened by the Syrian Armed Forces ability to fight back, some Syrians living in towns and cities reclaimed by their government might find cause to support Assad, lessening the possibility of his removal a bit more. Protectio trahit subjectionem, et subjectio protectionem. (Protection draws allegiance, and allegiance draws protection.) 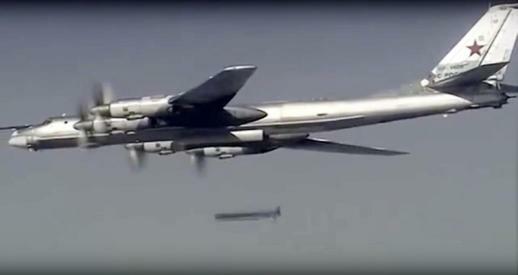 A Russian Federation Air Force Tupolev Tu-95 Bear H Bomber (above) fires a KH-101 air launched cruise missile at a target in Ildib, Syria. By supporting the Syrian Armed Forces along with forces Iran has brought to, or organized in, Syria, Russia might shape the situation on the ground there. If a massive offensive is eventually conducted by Syrian, Iranian, and Iranian-led forces, in territory taken, the Assad regime may try to “ensure” local political leaders and administrators, and local residents were supportive of Assad. Per sequar! (Do your part, I will do mine!) Concerning its diplomacy on Syria, Iran has decided to step up its coordination with Russia. The decision was made after a meeting in Tehran between Putin and Iran’s Supreme Leader, Ayatollah Ali Khamenei on November 23, 2015. A senior Iranian official told Reuters, “What was agreed was Iran and Russia would pursue one policy which will benefit Tehran, Moscow, and Damascus.” Russian-Iranian military cooperation was decided upon much earlier. An agreement for a joint Russian-Iranian military effort in Syria came into effect in July 2015. Both countries agreed to inject support into the Syrian Armed Forces to counter Assad’s accelerating losses. Joint operations rooms have been set up to bring the allies together, along with the Iraqi Government, which is supportive of Iran’s actions in Syria. (One joint operations room is in Damascus and another is in Baghdad.) Iran, itself, had already deployed several thousand Iranian Revolutionary Guard Corps (IRGC)-Quds Force (special forces) officers and advisers to Syria. They have mobilized pro-Assad shabihas (militias) into the 70,000 strong National Defense Forces, to fight alongside the Syrian Armed Forces, brought in Shia volunteer brigades from Iraq and Afghanistan, and, of course, Hezbollah fighters from Lebanon. Many IRGC officers and advisers have been killed fighting alongside their allies in Syria to include: IRGC-Quds Force Brigadier General (Sartip-e Yekom) Hossein Hamadani; IRGC-Quds Force Brigadier General (Sartip-e Yekom) Hadi Kajbaf; IRGC-Quds Force Brigadier General (Sartip-e Dovom) Reza Khavari; IRGC-Quds Force Brigadier General (Sartip-e Dovom) Mohammad Ali Allahdadi; Brigadier General (Sartip-e Dovom) Hamid Mokhtarband; and, IRGC-Quds Force Colonel (Sarhang-e Yekom) Farshad Hasounizadeh. On February 13, 2013, the initial IRGC commander in Syria, IRGC-Quds Force Brigadier General (Sartip-e Yekom) Hassan Shateri, was assassinated. Renowned IRGC-Quds Force Commander, General (Sarlashkar) Qassem Suleimani then took control of the Syria operation, flying often into Damascus. Once the decision on the joint Russian-Iranian effort was made, Suleimani visited Putin and Shoigu in Moscow in July 2015. He outlined the deteriorating situation in Syria for Assad’s forces, but also explained time remained to reclaim the initiative. Putin decided that it was time to act. Suleimani took on a central role in the coordination of Russian, Iranian, and Syrian activities on the ground. Reportedly, Suleimani was injured by a TOW missile fired by Syrian Opposition rebels on November 12, 2015. In diplomacy on Syria, Iran has decided to step up its coordination with Russia. 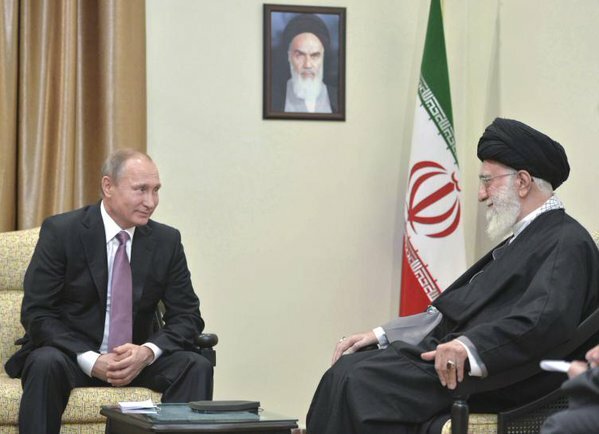 The decision was made after a meeting in Tehran between Putin and Iran’s Supreme Leader, Ayatollah Ali Khamenei, on November 23, 2015 pictured above. Russia and Iran will pursue a singular policy designed to benefit Moscow, Tehran, and Damascus. According to Russian defense and military officials, Russia’s airstrikes have targeted leaders of ISIS—and other Islamic militant groups such as Al-Qaeda linked Jabhat al-Nusra—when identified. Command, control, and communications centers of ISIS have been struck throwing the process of directing ISIS units into confusion. Training centers have been destroyed. Fighting positions of ISIS positions in front of the Russian allies have been degraded with close air support as well as very heavy strikes by Russian ordinance. Presumably they will provide close air support for an eventual ground offensive by Russia and its allies. (Ground forces utilized would primarily be Syrian and Iranian though.) Since air operations began, Russian fighter jets have conducted almost as many strikes daily as the US-led, anti-ISIS coalition has been carrying out each month in 2015. Russia has also conducted night strikes with damage assessment by drones. Reportedly, commanders of the Russian Federation Armed Forces believe the military objective of any ground operations in Syria should first be to create a regime stronghold in what is referred to as “Useful Syria” (Suriya al-Mufida) from Damascus up to Aleppo through Homs. That would require Russia and its allies to sweep up the Western part of Syria. It would take pressure off Latakia, a pro-Assad, Allawite heartland and locale of an important airfield and take pressure off Tartus, a long-time Soviet then Russian Federation Navy port that is important to naval operations in support of Syria. After reaching Latakia, Russia and its allies might turn toward Idlib. Part of the force could push farther north to gain control of the Syrian-Turkish border west of the Kurdish Democratic Union Party’s (PYD) territory, blocking the US coalition and ISIS from access to it. In an additional phase of their offensive, Russia and its allies may press eastward. A key objective would be to take Palmyra from ISIS and the oil and gas resources around it. Another key objective would be to push beyond Aleppo to retake the ISIS stronghold of Raqqa, which is the official capital of the so-called Islamic State in Syria. Moving that far out, some believe Russia may seek to co-opt the Syrian Kurds’People’s Protection Units (YPG) to help assist in the offensive. 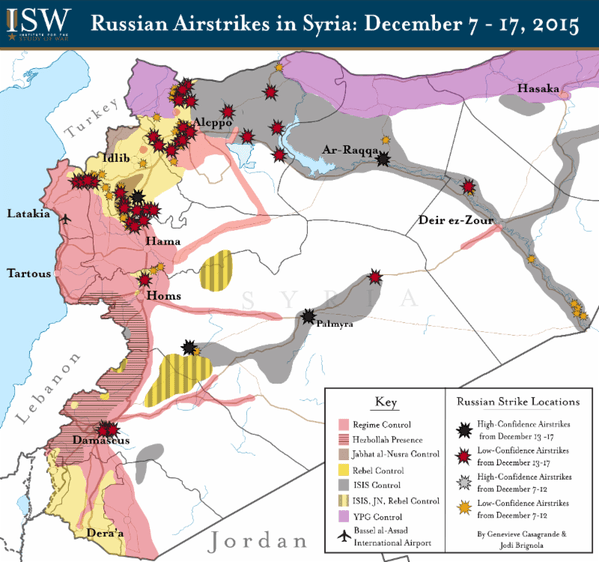 Russia has begun to increase the intensity of its attacks in all of the locations mentioned. Su-34 and Su-24 fighter-bombers have primarily been used on command posts, stores of weapons, oil products, and workshops where weapons for suicide bombers are made that are situated along prospective axes of advance of Russia and its allies. Bunker busting BETAB-500 bombs have been dropped from Su-34s near Raqqa with the goal of eliminating command posts along with underground storage facilities for explosives and munitions. Large numbers of ISIS fighters have been eliminated due to such strikes. The above map from the renowned Institute for the Study of War reveals the general pattern of Russian airstrikes and cruise missile strikes in Syria. Both ISIS and the Syrian Opposition would find it difficult to hold territory in the face of a superpower-sized onslaught by Russia and its allies. Putin likely wants pro-Assad forces to take the maximum amount of land possible west and north in “Useful Syria” and eastward in Raqqa and Palmyra, to broaden the Assad regime’s area of control and political influence. To enhance mobility and firepower for offensive action, Russia has transferred dozens of powerful, well-armored, T-90 tanks to the Syrian Army, particularly those fighting in Aleppo and near Damascus. The T-90s will also be used to enhance the combat power of the combined Syrian, Iranian, and Hezbollah forces poised to take Palmyra from ISIS. The T-90s were first delivered to the Syrian Republican Guards 4th Armored Division, commanded by Assad’s younger brother, General Ali Maher Assad. The T-90s will replace a large portion of the Syrian Army’s 500 tanks which are mostly Russian T-72s which are vulnerable to TOW missile systems provided by the US to Syrian Opposition fighters. The pace of the deliveries will be determined by the time needed for Russian instructors to train Syrian tank crews on the T-90. Large deliveries of Russian heavy artillery and multiple launch rocket systems have also had an impact on the frontlines of the Syrian Army, Hezbollah, and the Shia militias. That equipment includes: 152-milimeter MTSA-B guns, BM-27 Uragan and BM-30 Smerch rocket launchers, and TOS-1A Solnitsa rocket launchers. Russia and its allies have placed a steady onslaught of fire from those systems and from tanks on their opponents’ positions daily. If a major ground offensive gets underway, artillery attacks will surely intensify. Quae non prosunt singular multa iuvant. (What alone is not useful helps when accumulated.) To enhance mobility and firepower for offensive action, Russia has transferred dozens of powerful, well-armored, T-90 tanks to the Syrian Army, particularly those fighting in Aleppo and near Damascus. The T-90s will also be used to enhance the combat power of the combined Syrian, Iranian, and Hezbollah forces poised to take Palmyra from ISIS. The T-90s will replace a large portion of the Syrian Army’s 500 tanks which are vulnerable to TOW missile systems provided by the US to Syrian Opposition fighters. With the intermeshing of Iranian forces with the Syrian Armed Forces and the National Defense Front, a picture emerges of what Syrian Armed Forces and what Syrian communities along the axis of the Iranian-Syrian ground attack might look like in a year. One might recall what occurred in Bosnia and Herzegovina once the war ended in 1995. Particularly after 1994, members of the IRGC, IRGC-Quds Force, Iranian Army and Ministry of Intelligence and Security, referred to as “volunteers,” were folded into the Army of Bosnia and Herzegovina. Indeed, a few thousand Iranians became part of the 3rd Corps of the Army of Bosnia and Herzegovina, which greatly enhanced the force’s capabilities and the army’s overall combat power. The Iranian troops settled in many towns and cities in the Muslim-Croat Federation. The extraction of foreign fighters from the postwar Bosnian Federation Armija, and the Federation in general, was mandated by the national government in Sarajevo about a decade after the war due to international pressure. In Syria, the IRGC, IRGC-Quds Force, the Iranian Army, and the Ministry of Intelligence and Security will do much to influence the outcome on the battlefield but also will likely do much to help the Assad regime influence the result of elections despite UN monitors, by helping to “create support” for Assad and “coping” with regime opponents. The Assad regime likely has a limited degree of influence within the Syrian diaspora worldwide, including among refugees in massive camps in Jordan and Turkey or on their own elsewhere. Kerry is said to have proposed allowing all Syrians, “including members of the diaspora” participate in the vote at a UN meeting in Vienna on November 14, 2015, betting that if Syrians around the world can participate in the vote, Assad will not be able to win. Russia and Iran would hardly allow the situation to slip from their hands so easily. 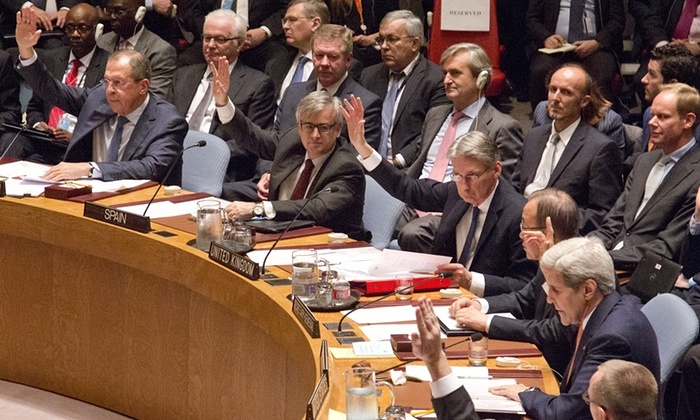 They likely believe that they can cope with that issue in the coming UN Talks. If Assad’s presidency is not viewed as legitimate by the international community following an election, due to any administrative difficulties that may arise or due to actions by the Assad regime or its allies on the ground, the impact on Assad would be minimal. By now, Assad has become inured to the hardship caused by UN sanctions and isolation stemming from the international community’s scorn. Moreover, Assad is, albeit, the “ward” of Russia and Iran. If problems arise, they will cover him. If Russia and its allies can gain control of a good portion of Syria, future threats of an externally orchestrated regime change by force will be precluded. Amicus certus in re incerta. (A sure friend in an unsure matter.) Expectations for talks established under UN Security Council Resolution 2254 may not be based in reality. The picture painted at the UN Security Council was of a factionalized, difficult Syrian Opposition that has suddenly become homogenized. Putin anticipates nothing satisfying from the UN Talks. He sees there is a danger that Russia’s interests will not be served. Rather than wait to be disappointed, Putin will likely seize the opportunity to shape the situation Syria to meet Russia’s interests and those of Tehran and Damascus. The art that moves Putin’s mind is not easily deciphered. His intuition likely tells him there will be plenty of debate and confusion at the UN Talks. Yet, he is likely more concerned that the process will not serve Russia’s interests. Putin will not standby for that and will try in advance of UN monitored elections to shape the situation in Syria to secure Russia’s interests and those of Iran and the Assad regime. Under UN Security Council Resolution 2254, offensive and defensive actions by the US-led, anti-ISIS coalition and Russia can continue. For Putin, that means Russia and its allies will be able to act “unimpeded” on the ground. Russia’s moves in Syria will not bar it from working on the talks alongside the other Permanent Five Members of the UN Security Council. Rather, Russia will be involved fully. With matters such as Libya in mind, its’ diplomats will narrowly focus on what best suits Russia and its allies. If Putin gets his way, there will be little left in Syria for the US to be satisfied with. The drama of the Obama administration’s failed interaction with Putin is nearly played out as the end of its second term nears. Kremlin observers allege Putin feels the administration has been marked by weakness. He will try to take advantage of the situation while it lasts. This entry was posted in Al-Nusra Front, Aleppo, Army of Bosnia and Herzegovina, Augustus Caesar, Ayatollah Ali Khamenei, Baghdad, Ban Ki-moon, Bosnia, Bosnian Federation Armija, Brigadier General Hassan Shateri, Center for Analyses of Strategies and Technologies, Damascus, Gaius Seutonius Tranquillus, God, Hezbollah, Homs, Idlib, Imperator Caesar Divi Filius Augustus, Institute for the Study of War, Iran, Iranian Revolutionary Guard Corps., Iraq, Iraqi Shi'a militia, IRGC, IRGC Quds Force Commander General (Sarlashkar) Qassem Suleimani, ISIL, ISIS, Islamic State of Iraq and Greater Syria, Jabhat al-Nusra, Kalibr 3M-14 sea based cruise missile, Kalibr Cruise Missile, Kalibr KH-101 air launched cruise missile, Kerry, Lavrov, Mark Edmond Clark, Ministry of Intelligence and Security, Iran, Moscow, National Defense Forces, Obama, Putin, Qassem Suleimani, Quds Force, Raqqa, Russia, Russia vs. ISIL, Russia vs. ISIS, Russian Defense Minister Sergei Shoigu, Russian Federation Defense Minister Sergei Shoigu, Russian Federation General of the Army Sergei Shoigu, Russian Federation President Vladimir Putin, Russian Federation Tu-95 Bear H bomber, Russian Foreign Minister, Russian Foreign Minister Sergei Lavrov, Russian President Vladimir Putin, Russian T-90 tank, Sergei Lavrov, Sergei Shoigu, Shabiha, Syrian, Shi'a, Suhkoi Su-24 fighter bomber, Sukhoi Su-34 Strike Fighter, Supreme Leader, Suriya al-Mufida, Syria, Syrian Armed Forces, Syrian Army, Syrian President Bashar al-Assad, Tehran, Tu-95 Bear H bomber, Turkey, UN, UN Secretary-General Ban Ki-moon, UN Security Council, UN Security Council Resolution 2254, United Nations, United States, US, US President Barack Obama, US Secretary of Defense Ash Carter, US Secretary of State John Kerry, Useful Syria, Vasily Kashin, Vienna by greatcharlie. Bookmark the permalink.